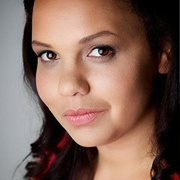 In 2014 Kerry Warkia was awarded the WIFT Woman to Watch Award for her work in new media. Warkia has produced a number of high profile web series, including wannabe famous comedy Auckland Daze, Flat3, and pioneering children's web series Nia’s Extra Ordinary Life. Warkia runs company Brown Sugar Apple Grunt Productions with her partner Kiel McNaughton. The pair originated Māori Television hit Find Me a Māori Bride, and all women anthology feature Waru. Warkia also has credits as an actor and writer.